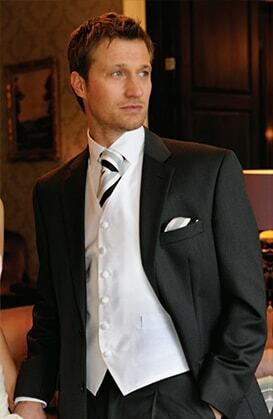 We don’t just provide bridal wear, we also have a range of men’s formal wear for the groom. Take the opportunity to find the formal wear that suits you best in our relaxed atmosphere in the countryside, away from the bustling towns and cities of Ireland. A lot of focus is put on the wedding dress when it comes to the big day, and you’d be forgiven if you thought men have it easy: “all they have to do is pick up a suit”. This is actually not the case. Men want to look and feel just as good on the day and look back on the photos happy with how they look. It’s important to think about men’s formal wear for a wedding, and not leave it to the last minute. 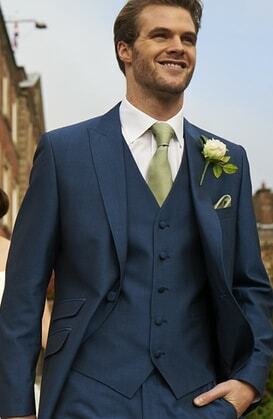 If you’re organised nice and early, not only will the bride feel better, but the groom will have more time to look at men’s formal wear in more detail, and be able to decide what he and doesn’t like, and be able to choose accordingly, instead of just picking what is available in his size. But what are the popular looks for men’s formal wear this year? The main theme seems to be individuality. This might not be a specific look, but its more about people being able to wear what they like and feel comfortable in, without being constrained by convention. If you’re happy with the way you look, you’ll be less nervous and be able to enjoy the day more. The traditional wedding wear was always morning suits or three piece wedding suits in a muted colour with colours to match the bride’s flowers. 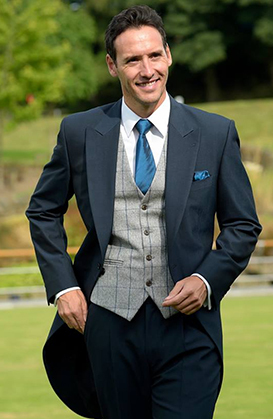 A three piece suit can be warm and not all that comfortable for those that are broader – not everyone wants a waistcoat. A morning suit’s length won’t suit everyone, especially those that are shorter. This year, men are encouraged to look sharp in formal wear for their big day, but not get hemmed into what they should be wearing. This might mean a slightly less formal suit, a jacket of a different length, a different colour jacket to trousers or anything, as long as you try it on and make sure it looks good and not rely on what it looks like on others. Other ways that men’s formal wear is being made more individual is with different button holes. Men are wanting to put their own stamp on the flowers, and instead of just flowers are picking more interesting and unique arrangements involving their hobbies and interests – from golf balls to action figures! Whatever men are thinking of for their formal wear this year, for their big day they should make the effort so that they enjoy looking at their wedding photos in the future, and wow the bride as much as she wows him. Please contact us on +353 53 9232586 or email hildakavanagh@gmail.com to arrange your appointment.